It’s surprising that New Politics haven’t taken off more than they have. Following in the wake of acts that Pete Wentz has previously taken under his wing like Panic! At The Disco and Cobra Starship, both in terms of sound and projected career path, you would think that this Danish trio would’ve achieved a similar level of critical success at this point, but particularly with their last album Vikings in 2015, they’ve largely been ignored in a way that those other acts (especially Panic!) managed to avoid. And thus, it comes as little surprise that fourth album Lost In Translation sees New Politics taken a new approach to their sound, taking a few steps away from pop-rock for a genre-fusion approach grounded in a primary sound that draws extremely liberally from Twenty One Pilots. Now, for anyone familiar with AJR’s utterly execrable album The Click from earlier this year, some alarm bells might have started ringing, seeing how much in common it and Lost In Translation have – the clumsy welding together of genres; a tendency to dive headfirst into obnoxiousness; a generally perfunctory Rivers Cuomo cameo – and while New Politics manage to stay well away from overall awfulness in that capacity, there’s still a lot here that feels too shoddy and mismanaged to really give a pass to. Most of that can be attributed to how blatantly New Politics ape the Twenty One Pilots formula, and in the sort of heavy-handed way that not even David Boyd sounding exactly like Tyler Joseph is able to rectify. Lost In Translation often feels like it’s in a purposefully quirky headspace given how twee its ungrateful fusions can be, like the ragtime piano of Madeleine, or Lifted which is part twinkling, Coldplay-esque ballad, part African-inspired chants before an attempt at a dubstep breakdown crashes through in the back half. At least with Twenty One Pilots, there’s some degree of knowledge surrounding how to blend their concoctions together; New Politics feel content on just smashing pieces together and seeing what works with no thought of tact. As such, there’s very little direction to follow along with, one minute going down the road of Japanese-inspired indie-rock on Tell Your Dad (of which Cuomo’s involvement just can’t be a coincidence), to scuzzy dance-punk on Lifeboat, to Wombats-style electro-pop on Istanbul. The one conceivable through-line on Lost In Translation is that New Politics do keep a bit more noticeable guitar into their sound, something that’s quickly becoming more and more of a rarity, but serves as one of the sole pieces of connecting tissue between these songs. CIA has a choppy groove that ups its likability factor somewhat, and while Color Green is a bit slow to get going, there are some nice, shiny guitar and banjo melodies that are more wistfully pretty that outright boring. The most impressive example is Lifeboat, stripped back to a relatively raw garage-punk track that draws as much from The Hives as it does Fall Out Boy and shows a knack for harder material that New Politics have never embraced. It would probably fit better with their lack of subtlety than Lost In Translation currently does. Admittedly some thicker, ruffled production gives it a bit more body that’s definitely beneficial, but there’s a lack of real modulation on tracks like One Of Us and East Coast Thrilla that comes in instrumentation that blares out without stopping for breath, and Boyd’s braying vocals that offer little in the way of respite. At least a couple of the slower numbers prevent this from being actively grating, but Lost In Translation still sees New Politics pushing themselves full-force in a fashion that doesn’t benefit them. But perhaps where Lost In Translation fails the most is that it just fails to be memorable. For an album so overtly pivoting in a pop direction, the lack of truly sticky hooks or choruses means that New Politics really lose their way on principle alone here, and though in pieces there’s promise to be seen upon going ahead, Lost In Translation is more transitional than anything. With a more concise knowledge of how to get around this sound more effectively, New Politics could be the pop-rock force they were tipped to be; right now, they’re too bogged down by their own ambitions to really go anywhere. 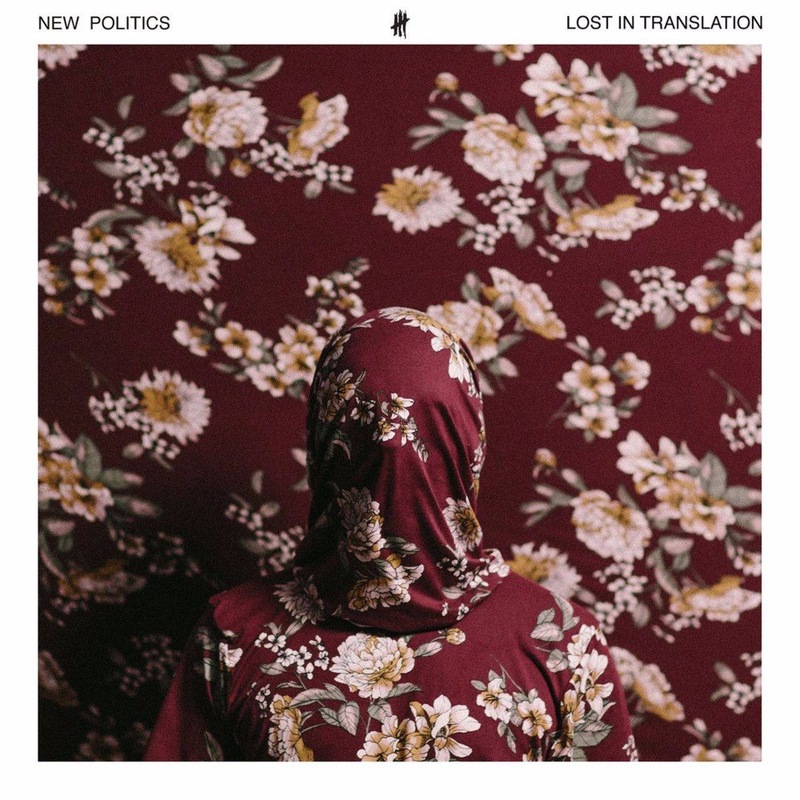 ‘Lost In Translation’ by New Politics is out now on DCD2 / Warner Bros. Records.